May is National Salad Month, the perfect time to bone up on summer side dishes for all those bear pool parties. At the risk of insulting your Aunt Betty’s famous potato/pasta recipe, it’s time for a mayonnaise intervention. Don’t get me wrong, I love mayonnaise and think no turkey sandwich or steamed artichoke is complete without it, but mayo presents three problems at your next summer cookout. First, pool parties and cookouts were made for grazing. We set out the buffet and take small (or large) plates several times over several hours of frivolity. That big gloopy bowl of mayonnaise disguising the pieces of potato or pasta concealed inside sits congealing in the hot summer sun. Yum! Problem two: Summer cookouts usually involve grilling (yay!) and that means fattier cuts of smoky meat with a crisp char. The last thing I need with rich meats, poultry and seafood off the grill is a rich, fatty bowl of potato salad. Where’s the acidity for balance and brightness? Finally, my husband hates mayonnaise, almost as much as he hates beets and even more than he hates blue cheese. If you’re inviting Jason to your party – and you should, he’s hilarious and gifted at getting your guests to remove their bathing suits as the sun goes down – you really want to serve a potato salad he likes. This is good for my marriage. Thank you in advance. Oh, and I like my burgers medium-rare. Try tossing with halved cherry tomatoes and basil, use fresh tasting tarragon and shallots, baby arugula or minced red peppers. Boil potatoes in salted water until still firm but can be easily pierced through to the center with a knife. Drain potatoes. Meanwhile, mince garlic and mash it into a paste with coarse sea salt. Whisk with Champagne vinegar and mustard. Season with pepper. 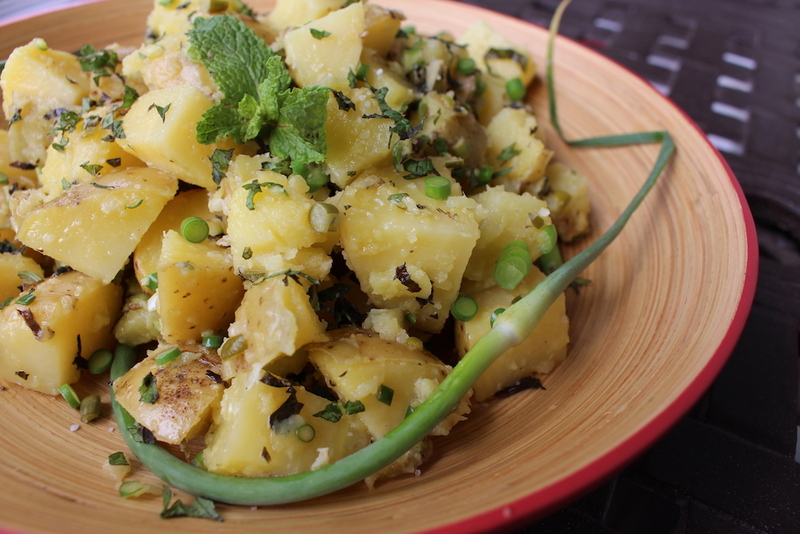 Cut warm potatoes in 1” pieces – halved or quartered – and toss with tarragon and garlic. The heat will release oils in the tarragon and garlic. While whisking, drizzle oil into vinegar in a steady stream to form a creamy emulsion. Toss with potatoes. Dress lightly so as not to overpower the other flavors. Season to taste with salt, pepper and additional tarragon.